A neutral gray reminiscent of concrete or stone. Gray Matte Fiber HTPLA feels industrial, but uses plant fibers for texture and sheen. Great for both artistic and technical parts with no special hardware required! 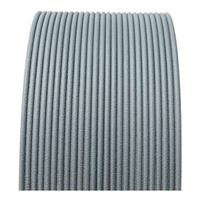 Based on Proto-pasta HTPLA, this Matte Fiber version can be heat treated to retain more stiffness to higher temperatures. Dimensional stability is improved compared to HTPLA without fibers. The plant-based fibers improve adhesion of glues and coatings. Performance is similar to Carbon Fiber HTPLA but processing of Matte Fiber does NOT require a wear resistant nozzle.